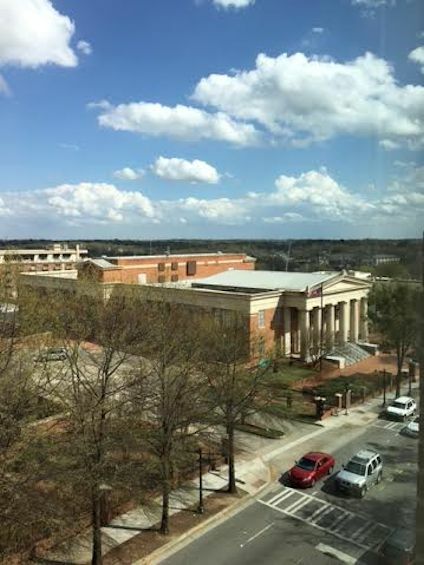 I am fortunate to be in Athens, GA for a gifted conference. I’m having a great time at the conference and with my niece, Elyse. My day started with the drive from Atlanta and I arrived in time to check in the hotel and head to the conference.  I was selected to give a workshop on Metacognition and Student Self-Evaluation. 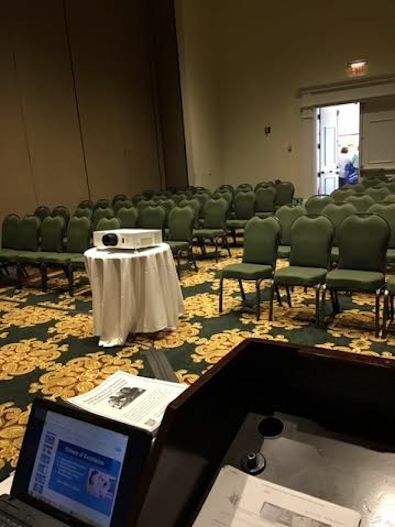 Here is my empty room waiting for the attendees. I had a nice crowd and the presentation went well. I’m always glad when they are over, though. Our conference luncheon was surprisingly delicious. 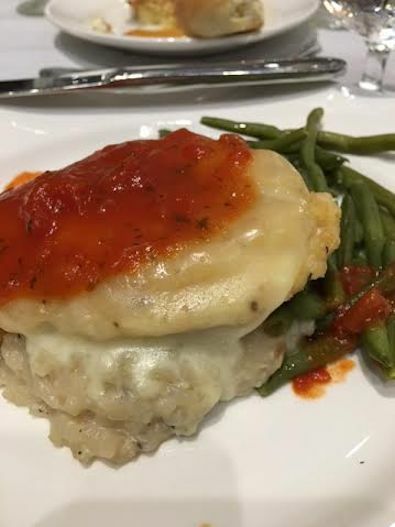 At first the food looked to me like it was a pile of gray mashed potatoes with spaghetti sauce on top. Not too appetizing, however the real meal was mushroom risotto, a breaded chicken cutlet, melted cheese, and marinara sauce on top. Delicious! 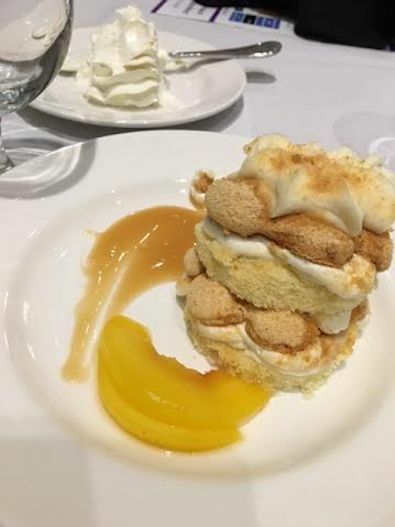 Dessert was a peach tiramisu. It was good, too. I controlled myself and only ate half although I wanted to gobble it down and bum bites off of others. After the conference I went to my room until time to meet Elyse for dinner. My view from the fifth floor. 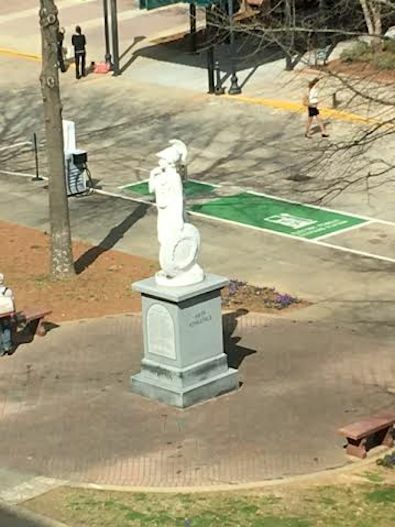 I also have a great view of Athena. 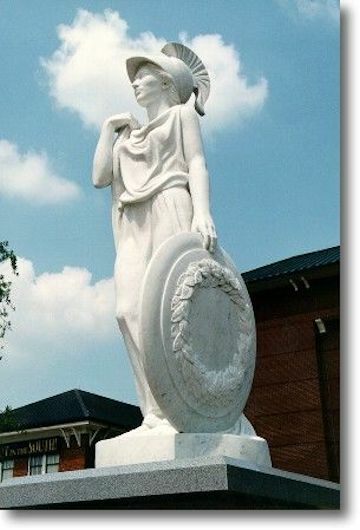 A local artist, Jean Westmacott, created the statue in 1993. Here she is up close. For all you art lovers, you can read more about Jean Westmacott here. 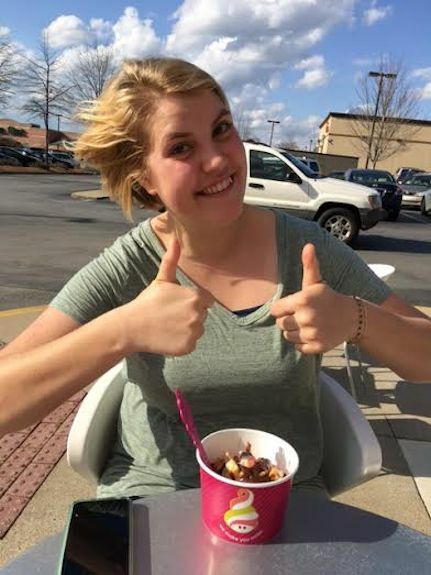 I met Elyse at our local favorite yogurt shop. Here she is in October when I came for the social studies conference and here she is today. I got a two thumbs up today. We ate a very small cup of yogurt (small is relative, I guess) and then headed out shopping . One stop was at Earth Fare, an organic grocery store. 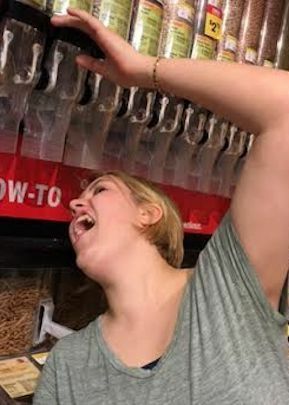 I reported Elyse’s shopping antics to her mom but she said she has the same problem with her. Use a bag!! 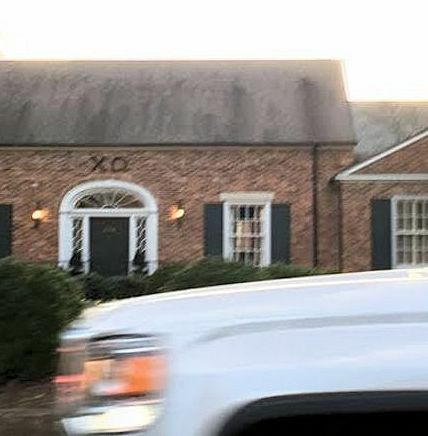 We got out of the store and whizzed past my Sorority house. And I do mean whizzed! I should probably have stopped to take a proper picture but we had more places to go. 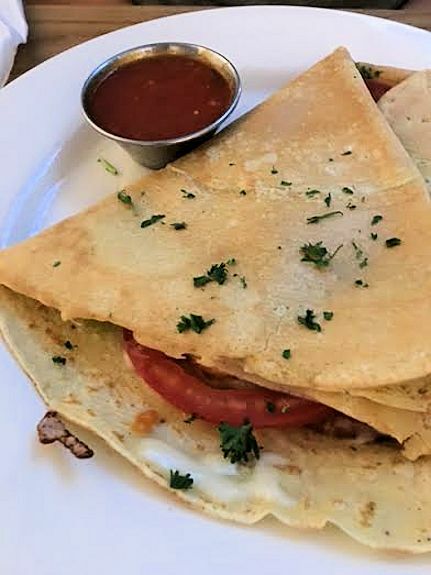 We decided we were hungry for real dinner so we went to Pauley’s Crepe Bar. Superb! 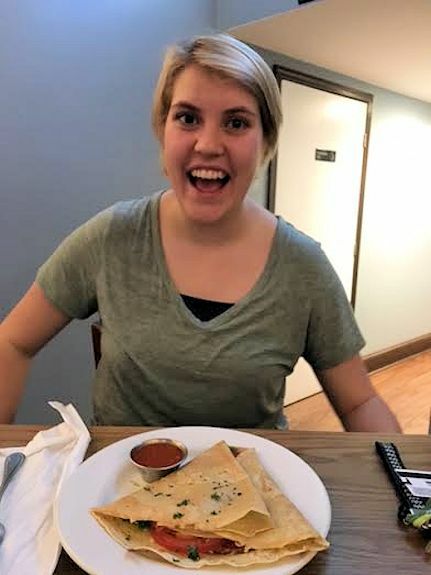 Elyse got the Caprese Crepe. While we were eating, the finale of The Bachelor came on one of the big screen TVs. Looking around I noticed that there was not a man in the restaurant. I guess the combination of crepes and Bachelor Ben was too much for the manly men of UGA. 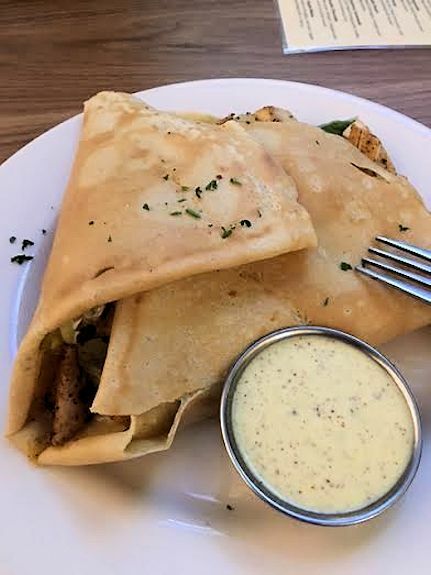 My crepe was the Chicken Caesar Salad. It was wonderful. My attempt to eat less meat didn’t work out so well today but I did cut back and not eat all the meat. I’m getting there. Vegetarianism is a slow process for me apparently. By now it was dark and the new tree lights were on. 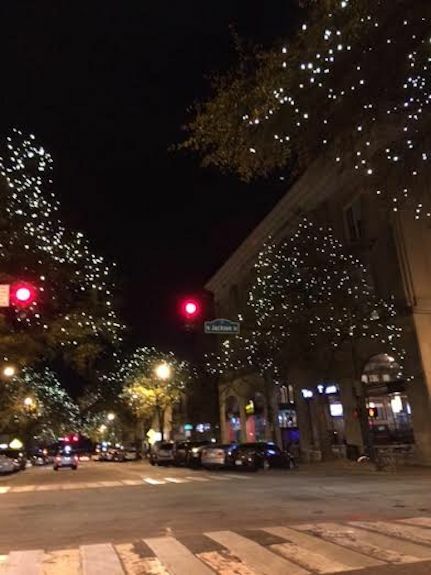 They looked so pretty down East Clayton Street. We capped off the meal with a cookie. 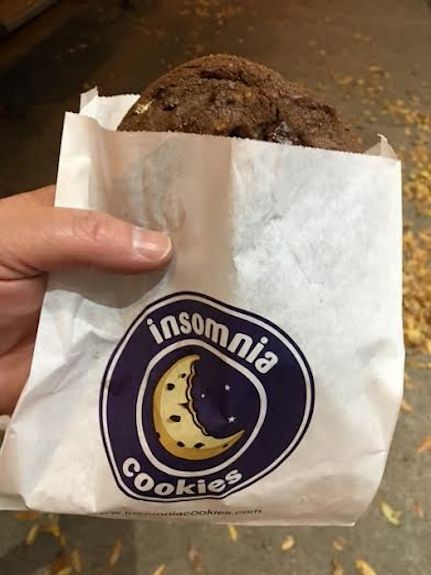 This place delivers warm cookies until 3:00 AM! I want cookies delivered to me in Peachtree City!!! It won’t be happening but what a GREAT concept! I will leave you with one last image. And by last, I really mean lasting image. 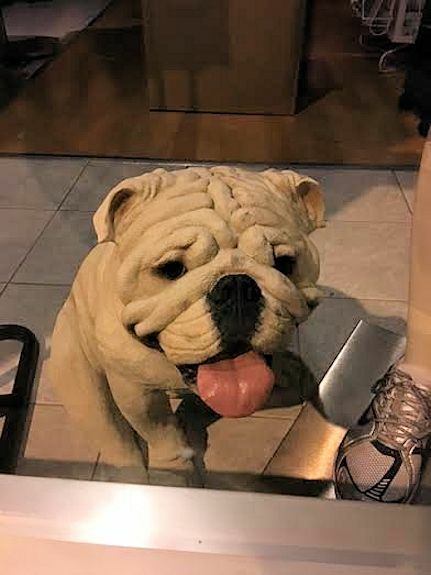 You know how the UGA mascot is the bulldog? Specifically UGA??? (Pronounced ugga). 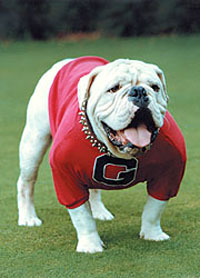 Here is a photo of UGA IV. Cute, huh? Lots of stores and restaurants have statues of him. Here is one from our walk down East Clayton Street. Sweet, huh? Well….here is a giant one I encountered in the Athens Kroger! YIKES!!! What is wrong with these people???? 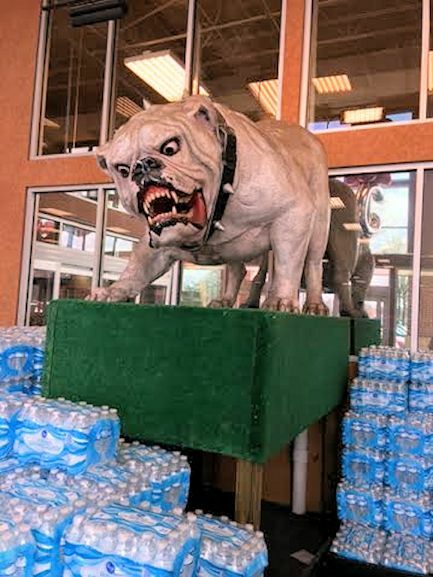 Will any child ever want to buy water again after seeing this monstrosity hovering over the Aquafina in the foyer?? Nightmares for all. One more day in Athens and then back to the grind. Does being in Athens make you feel like Dorothy? “There is no place like home”. Go DAWGS!! Having fun while working is a great thing. 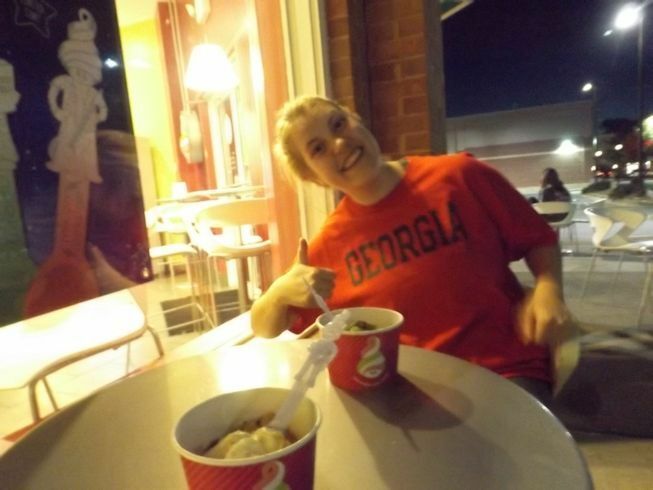 I always love going to Athens!